I love fresh bread. I have fond childhood memories of visiting my friend’s house when her mother had her bread-baking days. She’d spend a whole day making the bread for the month and the table and oven would be filled with loaves and trays of rolls, glistening with the melted butter brushed over the top. The whole house would be scented with the unique saliva-inducing aroma of fresh bread. We’d hover around until a loaf came out of the oven and devour several slices warm, without butter, savouring every morsel of yeasty goodness. It wasn’t until I had children of my own that I started experimenting with making my own bread. I’m no expert by any means, but I do enjoy the process of kneading, shaping, proving and baking. There’s something really satisfying about tucking into your own homemade loaf of bread, and it’s even more appealing when the children do too, making their little noises of bread-eating pleasure. This recipe makes a fantastic French style baguette. If I am serving it alongside a main meal I will make two large baguettes which usually get dipped into an olive oil and balsamic vinegar side dish (the children love this and it’s a great way to get some good fats into their little growing bodies). Day old leftovers often get sliced, lightly toasted, rubbed with a cut garlic clove and drizzled with a little bit of olive oil for a quick garlic toast. I’ll make four small baguettes for packed lunches or picnics. This recipe makes a perfect submarine sandwich base. I don’t know where the original recipe for this loaf came from, I’m afraid. It was copied off a website into my cookery notebook some time ago. It’s a really simple recipe to make and I encourage you to try it, especially if you’ve never made bread before. 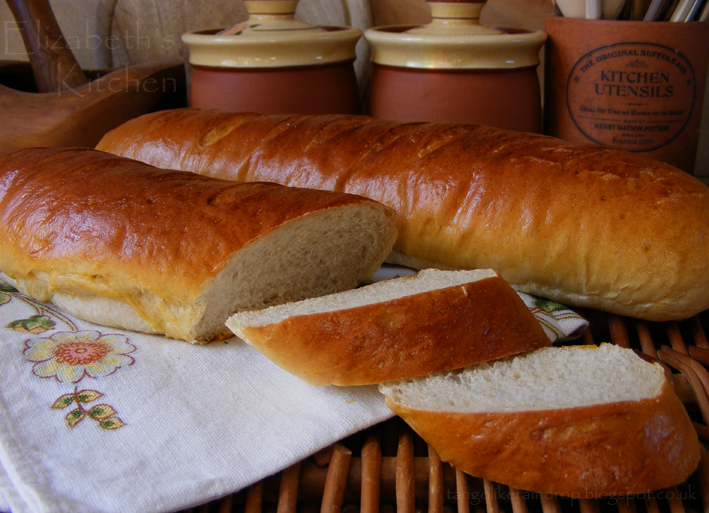 A traditional style French bread. 1. For a bread machine: Add the first 5 ingredients to the bread pan in the manufacturers recommended order and select the dough cycle. 2. To prepare by hand: Mix the flour, sugar, salt and yeast together in a large bowl. 3. Make a well in the centre and add the water, stirring with a wooden spoon until combined. 4. Turn out onto a floured board and knead for 10 minutes. 5. Return to the bowl, cover with a damp cloth and leave in a warm place to rise until doubled (about 1 hour). 6. When the dough cycle/rising time has finished, punch down dough. 7. Roll dough out into a rectangle 12 inches by 16. 8. 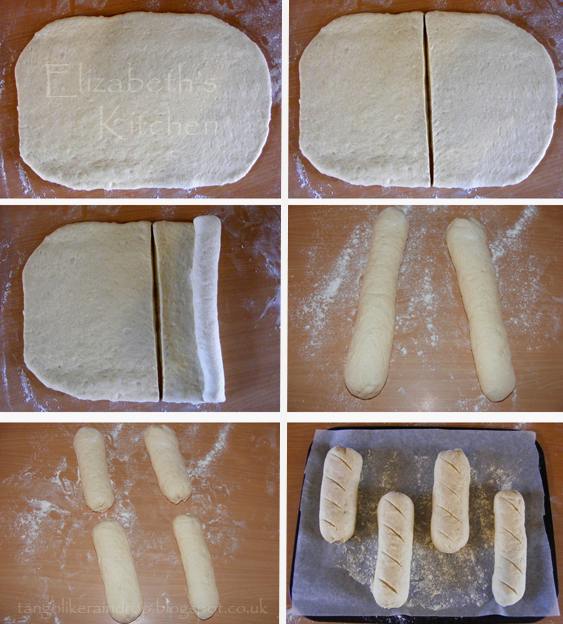 Cut the dough in half, forming two 8×12 inch rectangles. 9. Roll each rectangle from the 12 inch side, pushing out any air bubbles which may form. 10. If you prefer smaller baguettes for sandwiches, cut each larger baguette in half and reform the ends. 11. Score the top of the baguettes and leave to rise, covered, for a half an hour or until doubled in size. 12. Preheat oven to 190 C.
13. Glaze baguettes with the egg yolk mixed with water. 14. Bake for 20-25 minutes, until golden brown. Since this is a from-scratch recipe I have shared it with Javelin Warrior’s Made with Love Monday’s from-scratch recipe round-up. Aw thanks! I’m sure they will – good luck, and let me know how you get on! Thanks 🙂 Oh I do hope you try them! These baguettes look so good, Elizabeth. 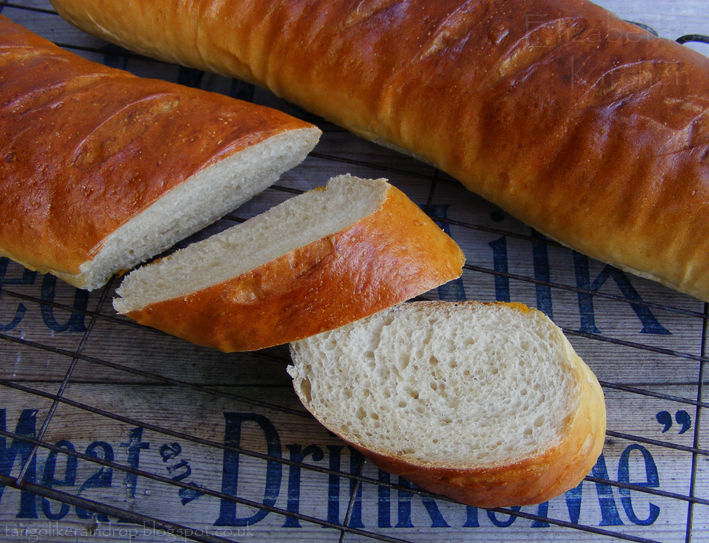 The texture looks just about perfect, perfectly chewy with a springy crumb… So tasty… I love that you bake your own bread! Thanks Mark! 🙂 This recipe does have a fantastic texture, I suppose that’s why I like it so much. That and it tastes wonderful! wow, these look fab! For some reason I always thought french bread would be tricky to make. 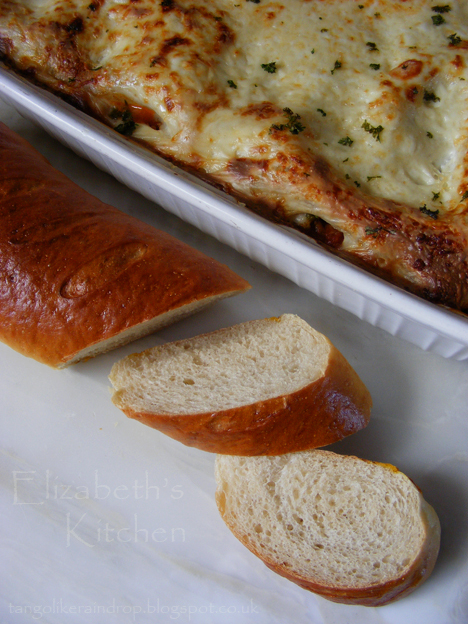 Funnily enough I just posted a french bread pizza recipe so now I have no excuse not to make my own french bread too! Oh I hope you liked it! This is one of my favourite bread recipes 🙂 Thank you!